A recent study found that 90 percent of kids in the U.S. carry backpacks that weigh as much as 10 percent to 22 percent of their total body weight. Researchers say these heavy bags may cause spinal strain and back pain, but there are things fathers can do to help alleviate potential problems caused by lugging these heavy loads. Dads should make sure the backpacks they buy their children have wide, padded straps and that their kids are wearing them on both shoulders. Experts suggest avoiding duffel or messenger-type bags that puts all the weight on one shoulder as well. 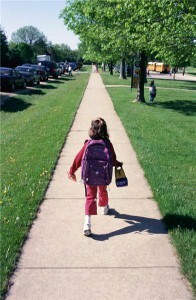 Consider a backpack with wheels if your child is carrying a lot of things back and forth to school. KidsHealth.com suggests that parents work with their kids to ensure they’re not overloading their bags with unnecessary things like laptops, CD players and video games and that they pack their bags correctly to evenly distribute the weight. Fathers should also encourage their kids lighten their load by storing books in their lockers or desks until they’re needed. Some schools may even provide an extra set of books for home to avoid weighing kids down. Many are also using technology like books on CD-ROM or posting required reading to the school’s website to cut down on excess luggage. Consider speaking with your school system about these options if you think there’s a problem. If your child complains about back, shoulder or neck pain or if they report tingling in the arms or hands, consult a pediatrician.